Q. How much difference does mic position make to vocals? I have heard from a 'proper' singer that changing the mic position when recording vocals can make a big impact on the way they sound. For example, rather than pointing the mic at the singer's mouth, you can point it downwards to capture more 'chest' or upwards to capture more of the nasal characteristics. I was also told that facing the microphone at a 45‑degree angle on the horizontal axis instead of at the singer's mouth would produce a less direct sound and could be better for recording backing vocals, as the sound will be softer. Does this really work? 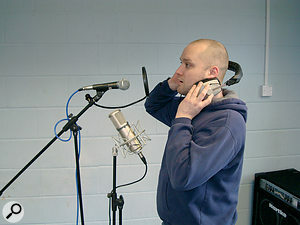 If you'd like to experiment with a different mic placement for recording vocals, using a dummy mic should encourage the singer to keep their head in the correct orientation. Here the dummy mic is the Shure dynamic in the higher position. SOS contributor Mike Senior replies: There's no question that changing the microphone's position when you're recording vocals will alter the sound, and for a variety of different reasons. Distance is one factor, partly because of the proximity effect of the cardioid microphones typically used for vocal recording, partly because a mic further away from the singer picks up a more natural representation of their head and chest resonances, and partly because extraneous sounds such as lip noises dissipate more quickly than the more resonant aspects of the voice as distance from the source increases. Another factor is the vertical position, with an important issue here being that higher frequencies tend to beam slightly downwards from the nose and mouth, so positions below the nose will tend to be brighter than those above. Some consonants, such as 'S' and 'P' sounds, tend to be worst directly on‑axis vertically. The horizontal plane is a bit more of an unknown quantity, as it seems to me to vary more from singer to singer and many vocalists sing assymetrically too, so the best thing to do is experiment, if you have the time. If you're moving the mic around, though, you need to make sure that the singer doesn't follow it with their head position and posture, otherwise they'll counteract the effect you're seeking. The easiest way to prevent this is to set up the pop‑shield and have the singer locate themselves according to that, rather than according to the mic. Putting lyric sheets in a sensible location can also do a lot to direct the singer's attention in the desired direction irrespective of mic position, and some engineers have even been known to use dummy mics for this purpose too. Changing the angle of the mic in any given position will also change the sound, especially if you've followed the norm of using a large‑diaphragm cardioid condenser mic. Even the best large‑diaphragm cardioid mics deliver an altered frequency response off‑axis, which usually means less sensitivity to the high end of the spectrum, and in principle you could, indeed, use this to soften backing vocals. However, in practice I'd recommend against it unless you're using a £1000 microphone on an experienced studio singer and in a well‑damped recording space. The first problem is that the off‑axis response of many mid‑priced and budget large‑diaphragm condenser mics isn't very well controlled at all, and exhibits all sorts of peaks and troughs that start sounding very nasty very quickly. The response will also change more in response to horizontal movements of the singer, so you'll do best with a performer who can stay rooted to the spot. Finally, you have to remember that if you face the singer into the mic off‑axis, the more sensitive on‑axis pickup of the mic will be pointing out into the room, and nine times out of 10 in small studios, this added room coloration is the last thing you want. I'd record on‑axis and leave it to a gentle high‑shelving EQ cut to soften the BVs at mixdown.